16 Apr From Quora: How would a Jewish man possibly react if someone cut his beard with a scissor? The ban also outlined specific restrictions on women’s dress. “An incident that caused Polish officials some concern and embarrassment occurred on a train to Kraków and involved three Galician merchants […] As the train was making its way, two of the Jews, Markus and Leibel, were attracted by music coming from the dining car. Upon entering the car they encountered several uniformed railroad clerks, police, and the Police Inspector, Jaskiewicz. The police demanded to see Markus and Leibel’s passports and began to question them. Then, at Jaskiewicz’s order, they produced scissors, grabbed Markus, cut off his peyos, and stripped him of his Jewish-style shirt and jacket. Next,they grabbed Leibel and ripped off his outer clothes. At that point, their third friend Berek entered the car. As neither Leibel nor Berek had visible peyos, the police at first only ripped off their shirts and jackets. But next they began to go for their beards, beginning with Markus. Here is the full paper by Dynner: The Garment of Torah. See also parts of the book Memoirs of a Grandmother for a woman’s telling of how scissors were used left and right. 22 Mar From Quora: How do Ultra-Orthodox Jewish men curl their payess so perfectly? This is how I did up side-curls nice and neat. My expertise: nine brothers, one son. Modeling for you is the kiddo, whose hair was reluctant to grow. Hence the short curl. On an ordinary day during the morning rush: grab a plastic cup from the pantry, grab the orange juice from the fridge. Poor about a quarter cup orange juice onto the cup. Then use a bit of orange juice to wet the sidecurl, comb the wet hair over the forehead. Push a pencil under the hair closest to the head. Now start twirling the hair around the pencil towards the face. Let the kid hold the pencil in place while you do the other one. It should be just a minute before the orange juice dries and the hair is nice and crispy. On special occasions — put a Bobby pin into the curl. And chup doesn’t fly either. All the hair up top. Oy. And this. What. What is this. Don’t even know what that is. Hollywood messes up the sidecurls far too often. It is so simple, duh! 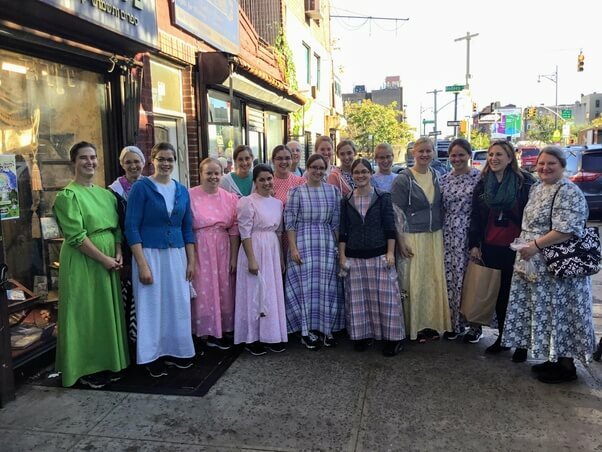 18 Mar From Quora: Why do the Amish and Hasidic Jews dress and live in a similar manner to one another? I gave a tour of Hasidic Williamsburg to a group of Mennonites, which are similar to Amish but maybe in some ways less insular. I think. That’s how they explained it to me. Notice me in the jacket without a pretty hand sewn dress! I look so bad. So much like a shiksa, a bad Jewish girl. But wait. They are all not even Jewish! 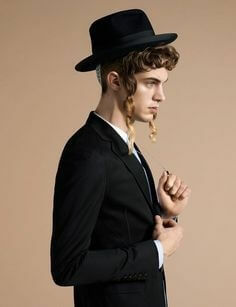 The similarities between Hasidim and the Amish is striking. Both groups are incredibly insular in their way of thinking and have a world view that sees change, assimilation, integration as the destruction of their people. The women also behaved a lot like my childhood friends. Everyone was very careful to say the right and proper thing. Dare I say… repressed? The one point in the tour that everyone broke into laughter was when I asked what kind of media they are allowed to watch, and then added on an impulse that came from my experience with Hasidim: “but don’t say anything that will get you in trouble!” and they all cracked up. They knew exactly what I meant. Whatever media you are watching that is verbotten, don’t mention that — everyone here can hear! The laugh was so knowing, so familiar. But there were big differences too. The Hasidim sounded positively metropolitan next to our group and — all took pictures of us. One Hasidic woman came over and said “Good for you, you come here. We go to you in Amishtown, you should come back and enjoy the sites back!” Her confidence was wonderful Another difference: the Hasidic men are also a lot less timid. What I realized is that both these groups believe in holding on to their traditions despite the changing tides around them. And when you try to preserve a way of life while you’re in the very enticing America with all its flashy colors and addictive ways, then you develop many similar methods: a unique language, dress and a rejection of popular entertainment. Both these groups have done it largely successfully.